dancers star left at a humboldt folklife society event earlier this month. In the Veteran's Hall in Arcata on a crisp September night, feet were skipping, sliding, stamping and turning. They moved swiftly in cowboy and cowgirl boots, work boots, an occasional Ugg or Keen, sandals, running shoes and the wayward pair of flip-flops. All kinds of feet were promenading all over the place at the Humboldt Folklife Society's monthly barn dance, which draws young, old and in between. The Folklife barn dances bring out packs of Humboldt State students -- even on a weekend night in a college town abundant with partying options. People urge their friends to come -- you've gotta try it, they insist -- parents bring their kids, and no one has to show up with a partner or know any steps when they arrive. A recent Friday night dance started slowly, but at 7:45 p.m. caller Sue Moon strode to the center of the hall, clapped her hands and shouted out, "Let's start! Others will come." Before Moon finished leading the first arrivals in a circle dance, a multi-generational stream of Humboldtians began to flow into the hall, with a growing clatter of heels clacking on the hard wood floor. Moon directed attendees to form squares of eight people, four couples each. One woman coming through the door barely had time to take off her jacket and throw it on a chair before Moon urged her to complete the fourth square so the dance could begin. "Snuggle up and make a basket." "Don't look at your feet." "Make a star if you all figure out your same right hand." "It's 16 -- are you counting?" Moon grew up in Dorsett, England, dancing English and Scottish country dances "from the tradition of the English farming people." She is one of the callers who appear regularly at the monthly Folklife Society barn dances, where dance styles include contra, square, English, Irish, French, and American social dancing, basically partner folk dancing. Musicians and callers can vary; when the Striped Pig Stringband plays, the emphasis is on square dancing. At the early September dance that Moon called, a fiddle and a piano filled the hall. The first notes that came from Blake Ritter's fiddle sounded like they were drawn from a deep well of water. Ritter's teacher, Sam McNeill, was on piano, the pair pouring out rich melodies that made people want to get up and dance the work week away. It was easy to forget that only two instruments were being played. As the crowd grew to more than 100 people, bevies of cowgirls in swirled in flowered dresses, bare-kneed above leather boots, with brown beer bottles in hand. White-haired folk danced with partners in skinny jeans and tank tops. A covey of sixth graders laughed as they joined bigger folks on the dance floor. "We like being with all the people we don't know yet. It's really fun because you don't have to know what you're doing," said 11-year-old Nigella Bauer, who lives down the street from the hall. She brought her sleepover friend, Chloe Stempler, to the dance. In the middle of one of the contra lines, a plaid-shirted man traded smiles with a blonde-braided woman as the skirt on her hips swished past his jeans. His hands wrapped around her waist and their torsos curved in toward each other, a perfect arc in time. Then, on to the next line and a new partner. During a break on the floor an HSU student who'd been to a few barn dances said it's always a fun night, and then scooted off to the next coaching session, following his date, who kept tugging on his hand. What a great first or second date. Lots of physical contact. No commitment. Regular attendees say they love the range of ages, the energy and the chance to meet new people. It's wholesome, said 22-year-old Michelle Wynkoop -- "Better than a bar and we can still have a beer. It's cool to interact with all different ages." Hoofing it barn dance style is an exhilarating workout that demands stamina. The only agenda is to have fun, and have it together as shifting collages of people grab hands, swing each other around, move apart and come together -- all in time to the music. 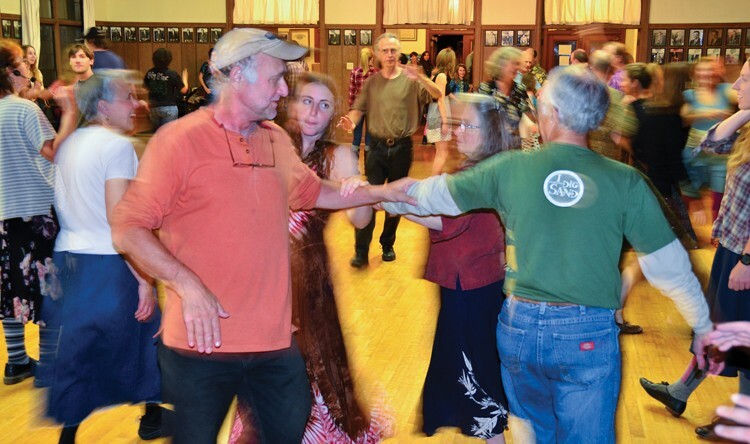 The Folklife Society puts a barn dance every month with varying callers and bands. September is a lucky double. On Saturday, Sept. 29, Moon will be calling again, this time with the Wild Rumpus Band, headed by McNeill at the Manilla Community Center. Find out more at, www.humboldtfolklife.org.